First of all, I apologize about the abundance of the photos by my Christmas tree, so far this month, but it is super cold out and on top of that I have been sick and I have worn a lot of dresses too with Dressember being a challenge I committed to this month. I have had a lot of headaches too, and if all of this wasn't enough, I had a really infected, swollen finger which make me take a trip to the ER yesterday. I am on antibiotics and pain-killers and had to call off from work two days in a row. When it rains, it pours, right?! At some point this month I wanted to do a 6 Remix, either with the same dress styled 6 ways or 6 different dresses styled with the same accessories. I wasn't able to do such a post but several of my dresses I have worn more than once, some at daytime and at nighttime, like today. So continuing this month, besides this one, there will be another 5 remix posts. Today I have on this Girly Fit+Flare Emerald/Teal Fit+Flare Dress (styled 2 ways), which I recently purchased at Target from their Xhilaration line (I am wearing the Medium since these are junior sizes). I think with the upcoming holiday season this dark green dress would be perfect. Plus the Emerald/Teal Color not only is a great color for Winter but a great all-year-round color. This dress paired so well with other dark jewel tones in the green and blue family. 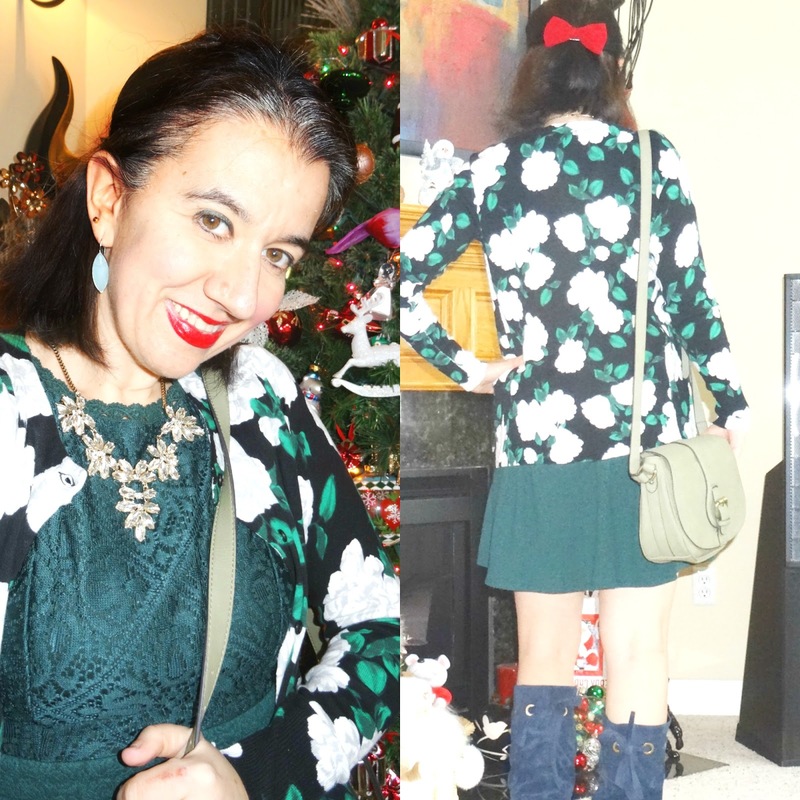 For the daytime look, I paired it with my Knee-High, Cone-Heel Navy Boots which tie into a bow on the back, my Floral Navy/White/Emerald Cardigan, a pair of Light Green Teardrop-Shaped Earrings and an Olive Green Saddle Crossbody Bag. 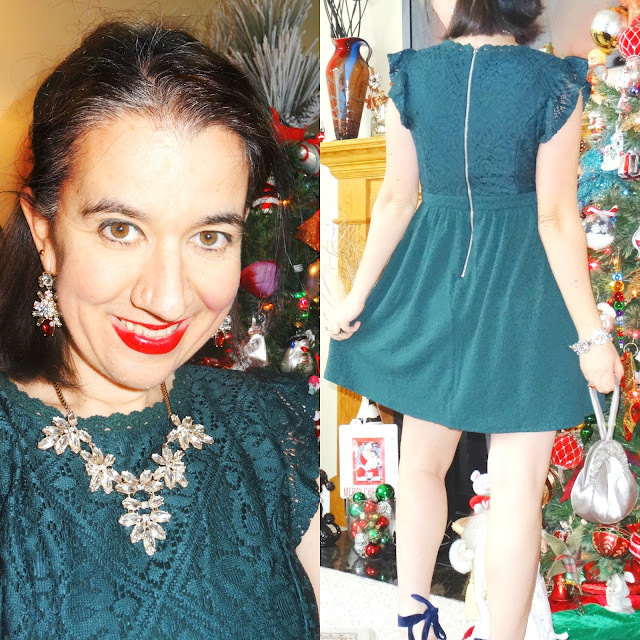 I added the Bold Crystal Necklace which I think paired perfectly with this dress to make each the day and night look, more festive. Also red lipstick which is perfect for this time of year and I added an extra pop of red with my Red Tuxedo Bow for my hair. This cardigan matches my dress perfectly doesn't it? 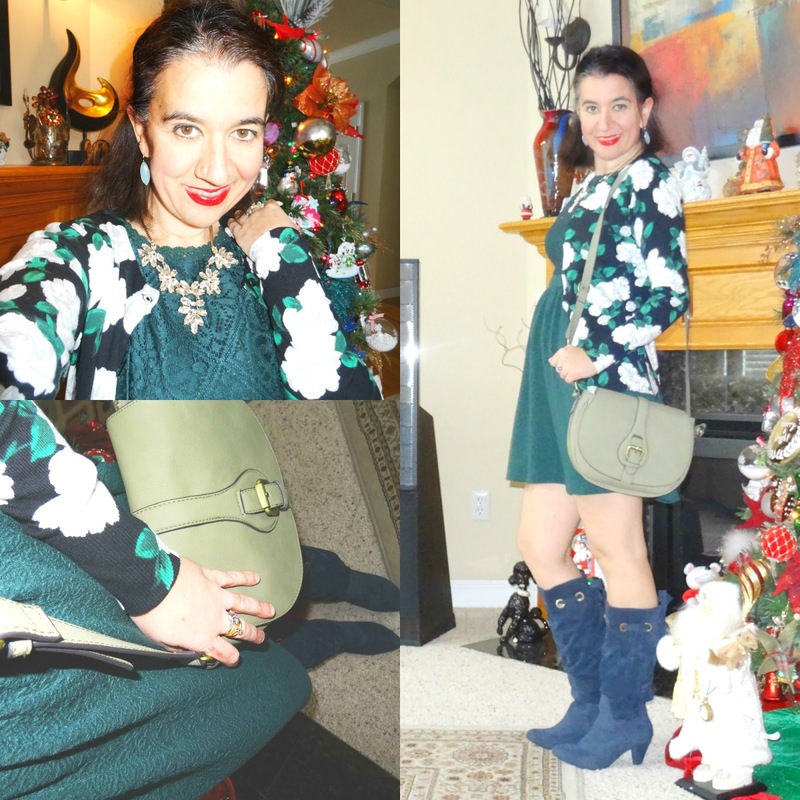 Olive Green Saddle Crossbody Bag w/ Buckle detail: Merona Collection via Target (similar, Steal), (similar, Great Deal), (similar, on Sale, my Favorite). 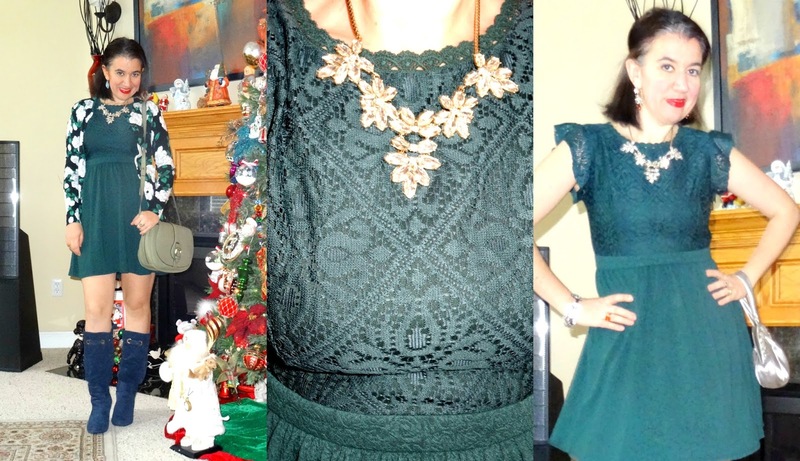 Emerald Green/Teal Fit+Flare, Lace Top Dress w/ Ruffled Sleeves: Xhilaration via Target (New) (similar, Steal), (gorgeous fancy off-shoulder option, Fantastic Deal), (similar, all lace, Great Deal, love this), (similar, dressy jacquard option, on Sale, my Favorite). Navy/White/Teal Green Floral, Crew-Neck, Long-Sleeve Cardigan: Merona via Target (New) (similar, Steal, love this), (similar, Great Deal), (gorgeous option w/ oversized flowers, Splurge, my Favorite). Deep Red Tuxedo Bow Barrette: Forever 21 (New) (similar current option from F21, Steal), (similar sequined option, love this), (similar in red+black, Small Splurge, my Favorite). For the night-time dressy look (dinner, dessert and martinis with 3 of my friends and one co-worker) I wore this same dress with these Bow-Back Blue Velvet Shoes I cannot stop wearing. I kept the same necklace and red bow as the daytime look. But I played on the jewel and silver factor with a Bold Crystal Bracelet, Silver+Plum Crystal Statement Earrings and also a Matchy Silver Beaded Wristlet Clutch. I got compliments from several people on this outfit, especially on my dress, shoes and red lips - which is a signature of mine. I think I like the evening look slightly more, though the daytime look is nice too. The night look says Holiday Dinner/Holiday Party, doesn't it?! 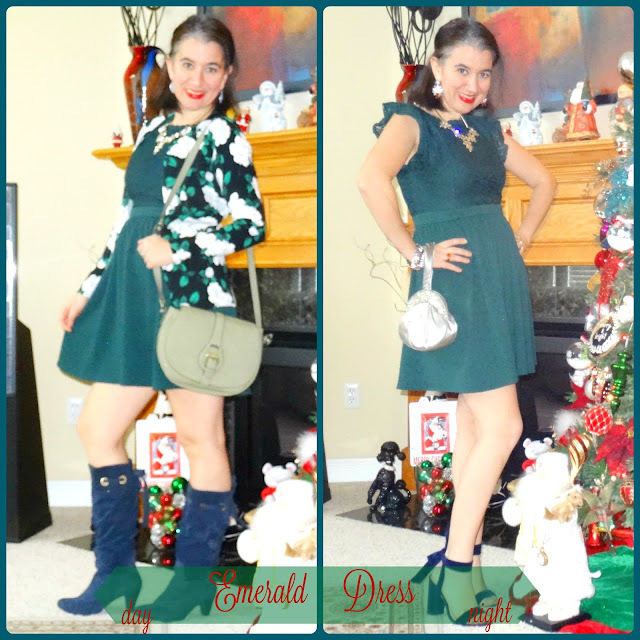 What about you, which is the favorite way I styled this Emerald/Teal Dress?! Silver, Silk Satin, Beaded Seashell-Shaped Wristlet Clutch: Macy's (Old) (similar simple option, Steal), (gorgeous pebble leather option, on Huge Sale, love this), (similar, small Splurge, my Favorite). Enjoy this last FULL week of December. Happy Holidays and stay warm out there! Don't get sick!